There is a tomb in Mehrauli, Delhi and a mosque as well. A mausoleum or rather a twin one, belonging to two people, buried side by side. They are called Jamali-Kamali and they are quite famous in the capital city. The mosque and tomb have verses inscribed on its walls – the ones written by Jamali and the interior design is simply breath-taking. People speculate about Kamali, since Jamali’s identity is known. Jamali was a Sufi poet in Mughal India. Babur and Humayun both were his patrons and enjoyed what he wrote. In fact, at some point, he also went to war and did them proud. That is the story of Jamali – more or less and nothing else to it. On the other hand, there is the question of Kamali, who isn’t known at all. There is nothing said or written about Kamali. There are a lot of speculations and a lot of rumours as well. Some say it was his wife. Some say it was Jamali’s lover. Some say it was Jamali’s nom-de-plume. There is another story as well to it – that of Kamali being Jamali’s male lover. With this in mind, Karen Chase set out to write a book of poems from both perspectives – that of Jamali and Kamali and their mad passionate love in Mughal India. Where perhaps, there was no reason to tolerate love. Love was just love – in whatever form or gender. 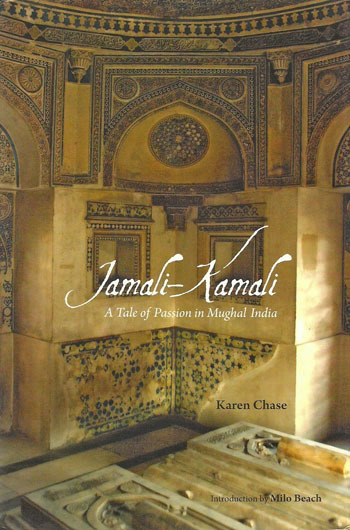 Karen Chase’s book begins with an introduction to the legend of Jamali-Kamali, followed by her exquisite verses, to be ended with Jamali’s own poem. The combination is lethal. There were times I had to stop reading and catch my breath as I was so overwhelmed by the writing. It is about love and it knows no shame. It is about love and it knows no gender. It doesn’t ridicule nor does it judge. Karen’s imagination runs wild. She holds nothing back in her writing and that is why it is so powerful. I recommend that people with bias read this. People who are prejudiced. People who see the world so narrowly that they miss out on its beauty. And yes, next year I sure will visit the tomb of Jamali-Kamali and say a prayer for all lovers. This entry was posted in Books, Homosexuality, Literary Fiction, Mapin Publishers, Poetry, Review and tagged homosexuality, Jamali-Kamali, Karen Chase, Love, Mapin Publishers, Mughal, Old Delhi, passion on October 27, 2013 by thehungryreader.